If you have ever run into situations like below where you need a DRM removal Mac solution, you may be interested to know how to remove iTunes DRM protections on macOS and transfer iTunes purchases to Google Nexus 9, Sony Xperia Z4 tablet, Samsung Galaxy Tab, HTC, etc. is not as hard as you may have thought. "I bought the movie "Iron Man 3" from iTunes and want to burn it to disk. Does anybody know how can i remove DRM from iTunes movies on Mac for free, or a paid DRM remover Mac (macOS Sierra) users can rely on? I legitimately bought the movie from Apple iTunes and just want to watch it on TV." "I bought several songs from iTunes Store but they won't play on my non-Apple cell phone. Is there any way to remove DRM protection on Mac so that I can play it on my Samsung phone?" Remove DRM protections from iTunes movies, TV shows, videos, songs, music, audiobooks etc and convert iTunes purchases to DRM-free MP4/MP3 for non-Apple mobiles & players by drag and drop with the best DRM removal software for Mac. MacX MediaTrans is the easiest and fastest iTunes DRM remover for Mac users. It easily strips DRM restrictions from iTunes movies, TV shows, videos, music, songs, audiobooks and more purchases, and auto converts protected M4V to MP4, DRM-ed audiobook M4B to MP3, Apple Music to MP3/AAC for free playback on Android, Google, Windows mobiles, VLC players or other non-Apple devices. The powerful iTunes DRM unlocker on Mac will retain all the 100% full quality, subtitles and audio tracks. Before we undock iTunes DRMs on Mac computers (MacBook Pro/Air/iMac), now free download the DRM remover for Mac (there is also Windows version for PC users). The program for Mac updates with the latest Mac OS X and iTunes versions. Connect iPhone iPad or iPod with computer with USB cable. To prevent any unwanted data loss, turn off auto iTunes syncing: iTunes > Edit > Preferences > Devices and select "Prevent iPods, iPhones, and iPads from syncing automatically". * For iTunes movies and audio books, click "Video" or "Book" on the main interface to enter into each section. Then choose the specific movies/books you'd like to unlock DRM protections, or "Select All" to transfer all the movies/books and bypass DRM on Mac OS X in batches. * To remove DRM from Apple Music, you need to go one more step. First, you need to open iCloud Music Library on your iPhone, and set it to share with other applications. 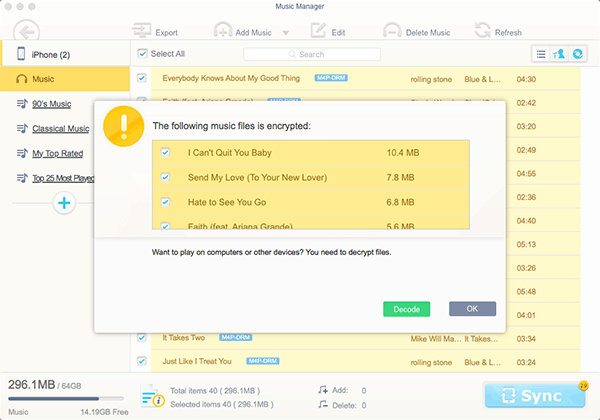 Then just select the DRM-protected songs. After you select the files, just click "Decode" button to strip the DRM restrictions. You can unlock DRM from iTunes movies on Mac free to MP4, convert Apple Music to MP3 and locked M4P songs/audiobooks to MP3 for free playback on other devices and players. Then click "Export", and all those iTunes DRM-locked media will be transferred to Mac in protected-free MP4 or MP3 files. 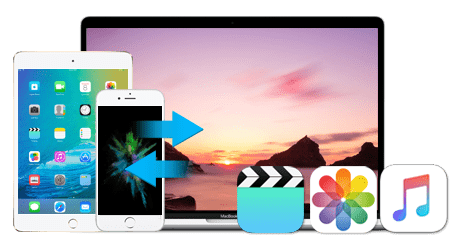 Thus, you can even transfer iTunes purchases to Android devices to watch iTunes movies on Android or alternatively play iTunes movies on TV with bigger screen. Q. Is it legal to remove DRM from iTunes purchase? A. Bypassing DRM from any media source for commercial use is a serious crime in most countries. However, it's widely considered that it's OK to unlock DRM from legally purchased items for personal backup or viewing only as iTunes movies/music/books are restricted to play on iDevices only, and is prohibited from sharing with families. However, you'd allowed to do it for personal use only. Q. Any other software for Mac users to bypass iTunes DRM? Why do you choose MacX MediaTrans? A. Yes, there are many other tools to strip DRM on Mac, like Requiem, M4VGear, myFairTunes, Calibre (to name a few), popular DRM converters on the market. Below we use a table to tell you why you would choose MacX MediaTrans as the best Mac DRM removal software. Note First software for Mac to strip DRM and transfer data at once. Requiem is out of development since 2012. Fast but works with iTunes DRM video only. It only supports iTunes 7.5.0 or earlier. It supports 50+ eBook formats. Verdict: MacX MediaTrans is unique that supports DRM removal from iTunes movies, music and audiobooks, and also transfers those protected iTunes purchases to Mac computers directly in DRM-free MP4/MP3 formats with good quality and fast speed. Q. What are the restrictions with DRM? A. M4V and M4P are the DRM-protected video and audio formats used by Apple in the content from iTunes Store (and other Apple products). With Apple's FairPlay DRM copyright protection, you're facing with many limitations, for example, you can't play them on Android, Windows or non-Apple devices. Note that HD movies are only playable on newer Apple devices; also you can't play them on VLC, Windows media player or others; you have to share your Apple ID and password if your families want to share your iTunes purchases (surely on Apple products only). That's why iTunes DRM removal Mac is a common need. Q. How can I burn the iTunes movies/music to DVD/CD? A. After you remove DRM from iTunes movies/music on Mac, now you can play them on Android, Windows, Google devices & players, and also burn them to disc to have a safe backup. To do this, a capable third-party DVD burner can help, like Cheetah DVD Burner. It can strip DRM copy protection and convert DRM media files, like iTunes DRM M4V videos to MP4 or M4P audio to MP3 when transferring files from iPhone iPad iPod to computer.